The war on Columbus has been going on for a while—and it’s to be expected in far-left enclaves like Berkeley—but it’s sad to see America’s foremost Catholic university join in the crusade. The Rev. 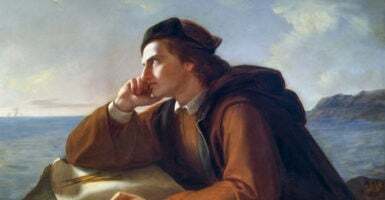 John Jenkins, president of the University of Notre Dame, announced Sunday that school officials would cover murals of Christopher Columbus, the famed explorer credited with discovering the New World. In a statement to the school, Jenkins said some found the murals offensive because they were “blind to the consequences of Columbus’s voyage for the indigenous peoples,” and saw them as demeaning. Jenkins acknowledged some of Columbus’ contributions, but said that wasn’t enough to leave the murals uncovered at his school. Of course, exploitation and enslavement existed in the Americas long before Columbus ever showed up. As historian Carol Delaney, author of the fantastic book “Columbus and the Quest for Jerusalem” wrote, painting Columbus as some kind of sadistic villain or the bringer of all evil to a kind of Garden of Eden is simply not true. “Judging Columbus from a present-day ethical standard is not only anachronistic, it reduces his intentions to their (unintended) effects; that is, it mistakes the consequences for the motivations,” Delaney wrote. She explained in an interview with the the Knights of Columbus, a Catholic fraternal organization, that detractors have wildly distorted many of the stories about Columbus’ abuse of natives in his own time and ours. We have to ask ourselves, must our heroes from antiquity be perfect? Undoubtedly, Columbus, a product of the late 15th century, had an outlook and worldview far different from our own, including much that we would condemn today. But if that were the reason to wipe out Columbus from public places, then we must simply reject all of human history, which is replete with cruelty, ignorance, tyranny, and untold characteristics out of step with modernity. For some, that may be the point. By saying that Columbus is unmentionable, a “deplorable” if you will, he becomes a stand-in for the entirety of American civilization, which they see as malignant. We shouldn’t be so quick to accept this destructive narrative. The Founding Fathers viewed Columbus as a symbol, not only of the discovery of the New World, but of a new age in the history of mankind. There is a reason our nation’s capital is called the District of Columbia in tribute to the famed explorer who planted the seeds not only of the United States, but nations throughout the Americas. How soon until we have to change that name because some are offended by it? In later times, especially after 1892, the 400-year anniversary of Columbus’ voyage, Americans reinvigorated their affection for Columbus as the world entered yet another age of scientific and technological advancement. Perhaps most importantly for Notre Dame, Columbus became a vital symbol for Catholics and Italians in the late 19th and early 20th centuries, in the face of widespread hostility to immigrants and the Catholic Church. In fact, the murals themselves, painted by Luis Gregori in the 1880s, were meant to encourage immigrants to come to the school at a time when Catholics and Italians were deeply unpopular in large parts of the country. The modern left, which insists that all immigrants are good and must be celebrated, apparently can’t be expected to defend the values of those who came to America a century ago. The fact is, places like Notre Dame wouldn’t even exist here in America if it weren’t for Columbus, the man and the symbol. Is that not worth defending? Is that not worth a simple, artistic tribute to the best aspects of his legacy? 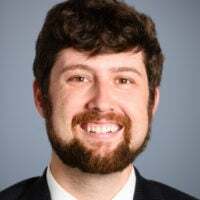 It is a sad indictment that a man who once clearly meant so much to so many would be unceremoniously cast aside and covered up by an ungrateful posterity with hardly a whimper of protest from the Notre Dame administration. Fortunately, a few dissenting voices are out there. Some alumni are protesting the school’s move, according to Young America’s Foundation, a conservative nonprofit, and they have launched a petition asking that the school leave the Columbus murals uncovered. If Americans wish to preserve what is best about our civilization, we need to do a better job of defending our existence and refusing to back down to the increasingly absurd and ever-escalating demands to remove our history from public spaces. It is a form of power politics, pure and simple. Though some do it in the name of tolerance and curing America of hate and bigotry, it will serve only to create further wedges between the American people and promote the idea that the only way to solve political differences is to erase those we disagree with from existence.